The Old Town is big enough to get lost in but not so big that you won’t be able to find your way out again. There are lots of great parks, plazas, shops, cafes, bars and restaurants in there. We think the best way to get to know this place is to walk around and see what you find. Getsemani (where we are) is a part of the old city but not the city centre as such. If you want to get to the main entrance, “The Clock Tower”, make a right once you walk out of the hostel and walk all the way down pass the park and towards the water. You will see the giant Clock Tower arched entrance to the Old City on your right hand side a block away. Head through there and let the exploration begin. Taking almost 2 centuries to build and surviving great storms and pirate attacks “La Muralla” is a spectacular sight all alone. There are 6 miles of old walls surrounding the city, many of which you can walk along and take a trip back in time. Good views all the way around. Riding around Cartagena on bikes is one of the quickest (because of crazy car traffic) and exciting ways to see the city. Ride your bikes along the wall from its 6 mile start to finish or ride around the narrow streets of the old city. 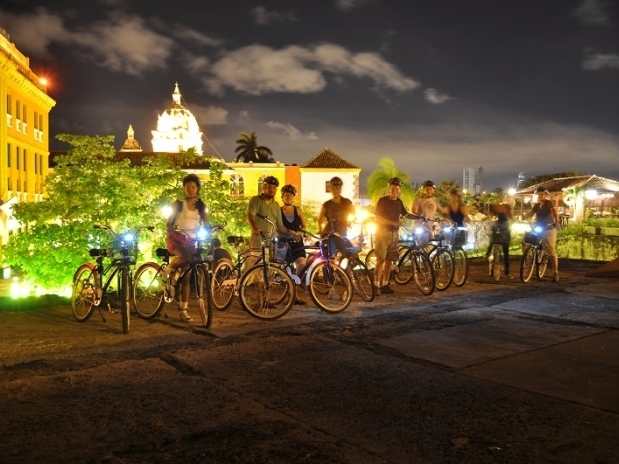 There are a couple of locations in Getsemani close by to rent bikes from. Maps are available with recommended routes. We recommend a trip up the coast to La Boquilla to get out of the city. The beach is ok and there are a few restaurants selling good seafood based meals for about $12,000. Ask for a menu and they will often return with a tray of fresh fish to choose from. The easiest one shop to find: once you walk out of the hostel make a right and walk down the Media Luna street, on your left hand side across the street from the Parque Centenario, there is a bike rental place; the bikes can be hired from 5000 an hour. (Adult/Child 16,000/8,000COP; 8am-6pm & apparently it is free on the last Sunday of every month. You can take a guided tour for 30,000COP in English. Located just down the road and over the bridge left of the hostel, this old fort with the giant flag dates back to 1536. It is an interesting place to walk around with some good views of the city. 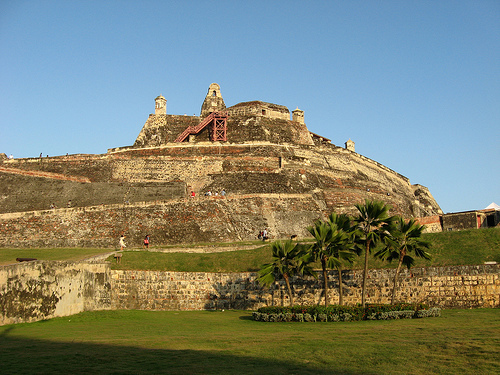 Biggest and strongest fort ever built by Spaniards during colonial times, it was never taken down despite numerous attempts. Try and get lost in the tunnels! (Adult/ Child 8,000/6,000COP; 8:30am-5pm.) Officially named Convento de Nuestra Senora de la Candelaria, it used to be a small wooden chapel, which was replaced by a stouter construction when the hill was fortified. There is a beautiful statue of the cities patroness La Virgen de la Candelaria and a gorgeous flower filled patio. There are great views from the top of this 150 meter high hill west of the city. 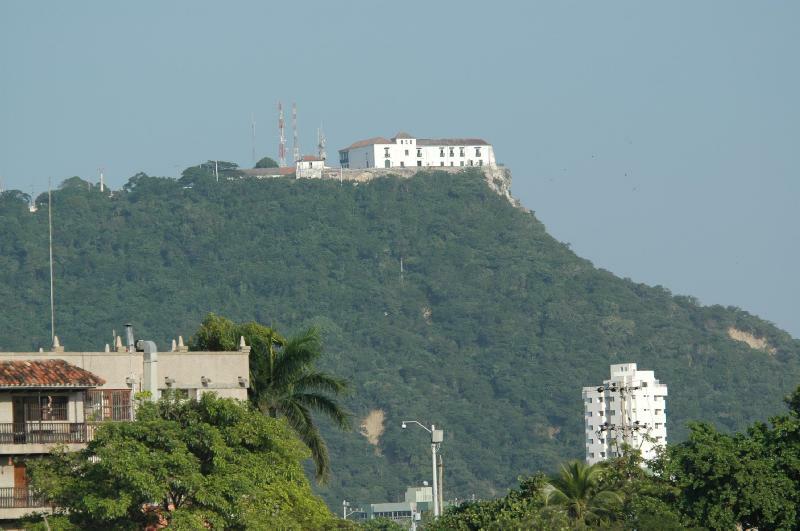 It is also the highest point of Cartagena. The convento de Nuestra Señora de la Candelaria is at the top and is an interesting place to look around. It is not advised to walk up there yourself, as there are poor small villages close by. Take a taxi and it will cost 5000 to 10000 pesos. Located at the main entrance to the old city from mainland, it is a tribute to the native American slave woman who served as translator between the indigenous people of Turbaco and the Spaniards. Make a left once you walk out of the hostel and another left corner, follow the road all the way down to the bus station and she’ll be on your right hand side. This is also the main stopping point for all local buses. Mostly congregating at the Clock Tower they can usually be found anywhere. These horse drawn carriages are a nice way to see the old town, day or night. The drivers are generally very knowledgeable about the area. There are a wide range of trips available, but as a guide they cost about $60,000 for 30 minutes. This can include up to 7 or 8 people. Most of the horses and carriages are waiting by the clock tower. This modern shopping mall has all the shops and fast food you’d expect. It also has a decent arcade and a cinema. It is a good place to escape the heat. There is a sports bar with a wide selection of beers (Beer Station). There is also a big Carrefour supermarket here. It is a 30 minute or so walk away, slightly longer if you detour past the marina in La Manga which is a nicer walk. Taxis should cost $6,000. The bit with all the tall buildings, Boca Grande is the Miami of Cartagena. Nightlife is limited here but we recommend a walk around the peninsula. There is an ok beach surrounding most of it. For smaller waves go to the Castillo Grande area, the southeast peninsular of Boca Grande, waves are small but surfable. Lanchas are available to Playa Punta Arena (an isolated beach / fishing village 15 minutes away by boat) from La Guito at the southwestern tip. Return journey up to $20,000 per person. There is a good frozen yoghurt café nearby called Yogen Früz. To get to to Boca Grande, make a right one you walk outside of the hostel, walk all the way down to the Convention Center, follow it up and walk along the bay water. You will come towards the Naval Base in about 15 mins from there. Keep walking straight and you will be in down town Boca Grande, make a right on any side street and you will be on the beach. Taxi should be 7,000pesos from the old city. 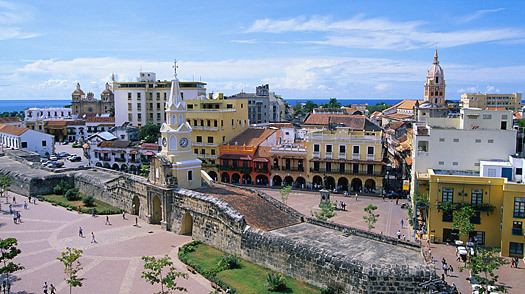 Heres our list of Cartagena´s Plazas and parks. Its not all of them but theres too many to include. You´ll also find that the directions to get there will be confusing, maybe it´s better to just walk until you find them! 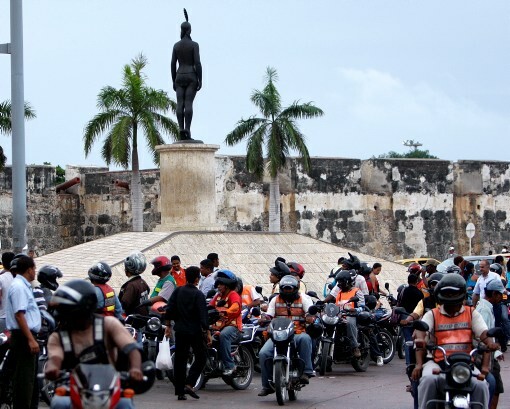 ( 3 Blocks behind the Clock Tower, on Calle de La Inquisicion) This park has the famous statue of Simon Bolivar. Surrounding it is the Palace of the Inquisition and the Cathedral. There is often a man selling corn so you can feed the pigeons. (Make a right once you walk out of the hostel and a right at the corner. Pass the main road and continue straight. At the new bus station, cross the road and make a left, walk towards the Exito super market. Make a right at the Exito and contuine straight for about 2 blocks, make a left and it’ll be in front of you in 1 block.) It’s a nice Square with some great restaurants around it. There’s a place called “Pizza en el Parque” which has delicious rustique pizza. There is also a Mediterranean restaurant called “La Sanwicharia” which has pitas with falafels, kaftas and large platters for two. Cartagena´s best Sushi bar is also located here(don´t expect cheap). (Make a right once you walk out of the hostel, and about 3 blocks down on your right hand side you’ll see the park) Is a large park in between the hostel and the Old City. Make a right once you walk outside of the hostel, the park is 2 blocks down on your right hand side. Lots of construction going on but a great land mark to find the clock tower. (Walk out of the hostel and make a right, another right at the corner, walk straight down and pass the main road, continue straight and cross the division in the rd, continue you straight until you walk up to a street called “Calle Jardin” and a small store on the corner on your left. Make a left at the store and 3 blocks down in the plaza) It is just up from Parque Fernando Madrid, there are plenty of restaurants in this one little plaza from steak houses “Patagonia” to little French and seafood places. This plaza is also home to the Santa Clara hotel and restaurant. There is a shop on the corner where you can buy a drink and sit on the steps of La Escuela de Bellas Artes watching the world go by. There is also live dancing and music on the weekends. One of the best plazas for hanging out and people watching. (Make a right once you walk out of the hostel and a left at the corner by “Havanna Club”, 1 block down and you’re at the plaza.) In the evenings this little plaza comes to life with locals and backpackers. Drinks available from the shop and there is a wide variety of street food. It has lots of atmosphere and a good place to meet people. Sunday’s there is live Zumba dancing and there are always young children playing soccer in the square. Fresh juice stands, hamburgers, hot dogs and kebabs’ are some of the many things to eat. This is the closest plaza to the hostel and easily the best in Cartagena. It´s yet to be over run by tourists and prices haven´t risen yet. It´s still full of local kids playing soccer and the parents playing chess. (Walk into the Clock Tower and make your first left, go straight and you’ll see the plaza in front of you.) Plaza de San Pedro Claver, at the southern end of the old town, is surrounded by very picturesque buildings. The old house and museum of San Pedro Claver is next to the Cathedral. The Museum of Modern Art is at the southern end and if you pass that you will find the Navy Museum, which we recommend visiting. (Walk into the Clock Tower and make your first left, go straight and you’ll see the plaza in front of you.) This plaza is the oldest and largest square in the city originally used as a parade ground. It is a recently renovated just south of the clock tower, also home to the old customs building, as well as Hard Rock Cafe. In this plaza you can find 3 ATM’s and close by the money exchange houses. It’s to the left of the clock tower once you walk through. This plaza was originally the site used for a slave market, next to the clock tower, is a busy place day or night. Donde Fidel (one of the most famous bars in Cartagena) is a great bar to sit and watch the world go by in the evenings. Just next door, under the arches, a row of stands sell interesting local sweets from 9am to 9pm every day. Just walk towards the clock tower and its right in front. Hostel Mamallena is a against the mistreatment and sexual exploitation of children. En Mamallena Hostel estamos en contra del matrato infantil y la exploitatión sexual de niños, niñas y adolecentes. Copyright Hostel Mamallena Cartagena © 2018.